The Community Energy Group was active from July 2015 and full of ideas to deliver community energy schemes. These schemes have been popular around the UK and essentially offer local people the chance to invest in solar (or wind or other types). They offered a modest return based on incentives from the Government aimed at lowering the UK’s carbon footprint. But, in October, in common with other groups around the country, changes to Government policies meant that the group had to take a step back and reconsider what is possible. 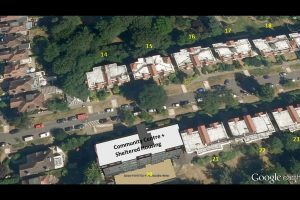 Originally the group, including some co-opted members from Transition Highgate, and liaising with Power Up North London (PUNL) were working on a plan for solar panels on the roofs of Holly Lodge Estate’s 30 mansion blocks and Community Centre (in Camden). The scope for the panels can be clearly seen in the accompanying satellite view and the panels would not be visible – important for a Conservation Area. A local solar firm confirmed that, if funds could be raised, considerable low carbon electricity a year could be generated. Although Holly Lodge looked like an ideal first site, the group compiled a list of other possible sites in Camden and Haringey to investigate. However, we could not form an approved Society in time for the cut-off date for the incentives that had made the Holly Lodge scheme viable. At that point Camden decided to proactively ‘pre-accredit’ renewables itself on many of its sites and PUNL managed to pre-accredit solar panels on the St Anne’s church in West Hill. Although St Anne’s is outside the HNF area the HNF Community Energy group is assisting PUNL with this scheme, thus building up knowledge and contacts. It will also work with Camden and Haringey where community involvement is required in the HNF area. Since the signing of the Paris Climate Change Agreement in December it is clear that the UK will need to increase its proportion of low carbon electricity and that the Boroughs will need to be involved in delivering this. So the HNF Community Energy group is keeping in touch with Camden, and similarly the Transition Highgate members are keeping in touch with Haringey to identify opportunities. In the meanwhile there may be schemes that would be viable with the use of some Community Infrastructure Levy (CIL) money. The HNF Community Energy group will continue to look for opportunities and utilise CIL money when it becomes available.